Berlioz’s epic masterpiece retells the magnificent saga of the aftermath of the Trojan War and the exploits of Aeneas. Rising tenor Bryan Hymel, in his Met debut, stars as the hero charged by the gods with the founding of the city of Rome. 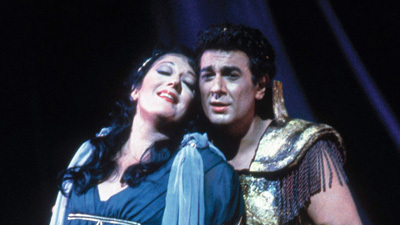 Susan Graham is Dido, Queen of Carthage, who becomes Aeneas’s lover, and Deborah Voigt sings Cassandra, the Trojan princess whose warnings about the impending destruction of Troy go unheeded. Francesca Zambello’s atmospheric production, featuring choreography by Doug Varone, is led by Met Principal Conductor Fabio Luisi.